Happy Monday everyone! How was your weekend? Have you overdosed on Halloween candy yet? I think I might have. All I know is that all weekend I have been craving something salty. I need to balance out the ridiculous amount of chocolate bars the kiddos scored on Halloween. I think the people in my neighborhood need to hand out more Skittles and Starbursts. Once Halloween is over we seem to be running on overdrive until the first of the year. Do you feel like your schedule has been kicked up a notch? Being so busy it is nice to have a quick and satisfying dinner you can easily whip up that the whole family will love. This is how this fried rice dish was born. Lately I have lost my cooking mojo (if you find it please return it to me) and we have picked up “convenience foods” far more than I want to admit. Making this quick and easy chicken stir fry I was able to fake having any sort of cooking motivation. If you have everything prepped and ready to go dinner will be ready in about 15 minutes. How wonderful is that? By using the frozen steam in bag brown rice (in the freezer section by the frozen veggies) I was able to make this dinner in about 15 minutes. 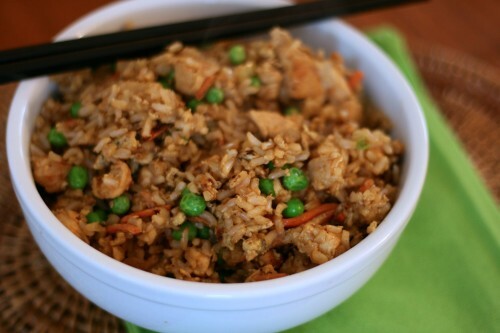 While stir-frying the chicken cook the brown rice in the microwave. Spread on cookie sheet and place in fridge to cool down once cooked. Heat wok on high heat with 1 tablespoon oil until shimmering. Toss chicken cubes with 1 tablespoon soy sauce. Stir fry chicken until cooked through. About 2-3 minutes. Remove to plate. Heat 1 tablespoon oil until shimmering. Stir fry carrots, onions, ginger, and garlic for about 2 minutes. Push to side. Add 1/2 tablespoon oil and eggs. Scramble eggs. Once eggs are cooked stir in veggies and add back chicken. Add cooked rice and rest of the soy sauce. Stir fry for 2-3 minutes. Toss in peas and cook until heated through. Remove and serve. 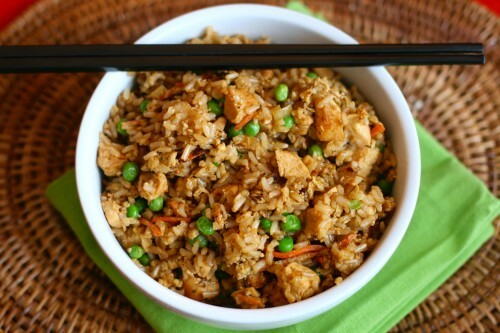 We crave chicken fried rice often in our house – this version is so quick and scruptious at the same time – thanks so much for sharing! You can make this faster than ordering take-out! I just ate 3 pieces of candy while reading this post, oh goodness, help me. 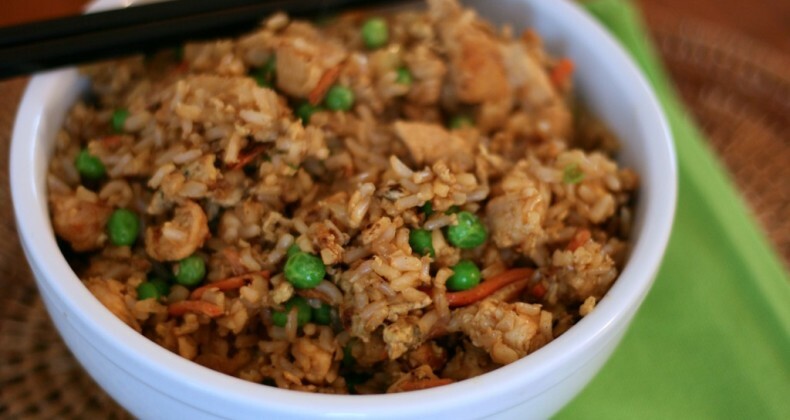 We love chicken fried rice so I can’t wait to try your recipe Jamie! It is nice having super quick dinners on the menu line up.